GRIT, determination and bravey – three components Brian Stock believes the Hawks will need for the daunting trip to National League title-chasing Salford on Saturday. Lee Bradbury’s side travel to the Manchester-based outfit with 17 places separating them in the league table. High-flying Salford sit second, while the Hawks are 19th following their midweek defeat at the hands of Dagenham & Redbridge. Captain Stock is looking for a reaction after that 3-1 loss, which ended his side’s four-game unbeaten run. He knows he and his team-mates will need to raise their game to get anything against Graham Alexander’s side. 'We have to be prepared to go there and roll up our sleeves,' said Stock. 'Grit, determination and bravery are all qualities that we will need. 'We know that we will have to be a lot more resilient than we were against Dagenham. 'At Dagenham we looked tired, leggy and not at it. 'Being a part-time club in a fully professional league, I think a few things caught up with us. 'They came flying out of the blocks and got at us from the start. 'After a very disappointing opening 10 minutes, we managed to steady things down. 'Unfortunately, we didn't have too much in the tank to cause them many problems. 'Salford is a massive test for us. 'You have two clubs at the opposite ends of the spectrum. 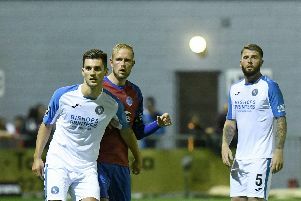 At Harrogate, Wrexham and Chesterfield this season, the Hawks proved they can be competitive away from home against the division’s so-called big guns. But if they are to stand any chance of upsetting Salford, they will need to get into the faces of the opposition and prevent them from playing. On too many occasions in midweek, Dagenham were allowed too much freedom. Stock knows his side have to be at it from the start. 'We can't afford to give teams in this league a head start in games,' he added. Then we just find ourselves playing catch-up. 'We have to put that defeat behind us. 'Recently, we have looked more like a team that can go out and win games. Will Wood is back in contention after completing a three-match ban. Paul Robinson faces a fitness test, but fellow central defender Tyler Cordner is ruled out after picking up five bookings. Rory Williams is a doubt after coming off injured in midweek.